Redcap’s are a very small myth, but one with a lot of potential for interesting interpretations – all of them murderous and mischievous, whether that be 13th Age with their fourth-wall breaking “secret word” or Redcap Jack in the Dresden Files. Redcaps are a murderous fairy, said to be found on the border of England and Scotland, mostly in castles. As for how old these monster are there is no hint really other than they reside in ruined castles especially those ones that have seen a tyrant, which in Britain there have been lots of since the time of the Romans. Their stories don’t tell of them causing mischief like most fairy instead they chase and kill any trespassers on their land, either by hit people with boulders or with his sharp teeth or using there iron spiked boots, then they sock there hat in the victim’s blood which is how it come to be red. If there red should fade then so would the redcap – so they must kill to stay alive. These story were often told to keep people out of ruined castles where rocks might fall on them, but also to stop people nosing around where they don’t belong, this maybe why Lord William de Soulis was said to have one as a familiar which resided in his castles to keep people out when in imprisoned in Dumbarton Castle which he died in but some story say that his redcap killed him. Another theory is that the redcap may be a metaphor for redcoats i.e. the English, who would often make use of the old castles, throughout the wars with Scots – however this seems unlikely as there are references to redcaps that predate the standardisation of the English to the red-coat military uniform. Their body may be fat or skinny but is alway wrinkly, usually covered in earth coloured clothing or armour. These murderous old fairy may be faster and stronger than most humans – which allows them to hunt their prey in their ruined homes. The iron boots are odd since they’re fairies and iron is meant to hurt fairies – this might mean they’re in constant pain, or that they’re immune to iron1)or even both – resistance through constant exposure. It’s also possible they use these boots to stomp on other, less bloodthirsty, fairies. They would make sense for assassins and serial killers in the modern day world. If they die from the red fading on their cap, are there other ways to kill them, like destroying their cap? Does it matter if the blood on the cap is from someone dead, or could they use portions from living people? If that is the case would a redcap be able to keep himself alive by doing blood letting of not just his victims but himself. 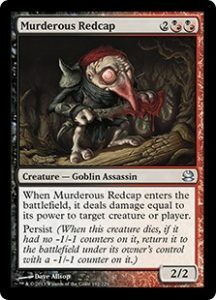 A great little fantasy idea is that a redcap is a gnome that been bitten by a vampire. This time of year is associated with ghosties and ghoulies and long leggedy beasties. But why? Apart from “it’s cold and dark and time for fires therefore stories”. 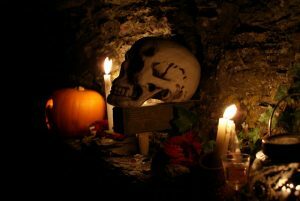 The derivation of Halloween from Samhain is a classic example of cultural evolution. The exact details of the original festival are unclear, because the Celts wrote down very little – most of our sources are later and/or Roman, and thus it is akin to studying the Blitz using only present day memories or German sources. Still, we know many of the details, and as the festival never fully died out much more can be recovered from the later forms. The world of the ancestors flows away from and towards our own, and comes close four times a year – at the beginning of each of the seasons. At Beltane – Mayday – the helpful spirits of the land cross over, and their blessings are welcomed with flowers and dance as summer begins. But at the beginning of Winter, darker spirits roam, and meeting one brings only curses. So the prudent householder would bribe the spirits with whatever he had excess of to ward off their ill will. The barley harvest falls in early September, so six weeks later, the first beer of the new year would just be ready, apples have also just been harvested and milk is less seasonal, so these became the traditional gifts. If one had a good harvest, one would share with neighbours, so that the spirits would see one as a good friend and be unable to harm the good man. Enter Christianity. The early church sought to adapt facets of the older faiths – it’s why Christmas falls so conveniently at Yule/Winter Solstice. The old spirits can’t possibly be good, therefore they must be devils. And anyone who feeds them must be witches. Of the old-crone-cursing variety, not our modern follower-of-a-nature-faith variety. So, the Church co-opted the idea of reverence for the gone-before, and invented All Saints and All Souls – an opportunity for any local do-gooder to be remembered and prayed for, reducing time in Purgatory. They ditched the pagan aspect, and made the returning spirits evil. The sharing-with-neighbours part fit too, and became the Harvest Festival. When the Americas were settled, Irish migrants took the old stories with them. As the USA developed its own culture as a blend of its constituent parts, the Irish merged with the French and Germanic witch and fairy traditions (for example, Oberon is first seen as an antagonist of Charlemagne) and All Hallows Eve became the time to mock the evil spirits by dressing as them. As sugar became a more prevalent product, giving the ‘ghosts’ a piece of sugar cane became easier than beer or milk. Sugar cane became chocolate, became any kind of Treat, to ward off the Tricks of the “fairy folk “. Now Halloween means hordes of small children begging for candy, and teenagers demanding money in return for not putting fireworks through your door.. I’m not sure I like the evolution, so I celebrate this time of year by sharing the fruits of my labour. Here you go, neighbour! Have a whole lot of thinking. If your fantasy culture has been around for a while – centuries or millennia – it has likely evolved in a similar fashion. There will be those who keep fast to some version of ‘the old ways’ and some who have applied them in new ways. If a nation has been conquered, colonised or even conquered others, the newcomers bring new customs and new gods, and few conquerors allowed the natives to worship unhindered. Even mundane things like introducing a new crop can reflect in the spiritual life of a people. According to a Papal Bull, capybara are officially fish (despite being rodents) so Catholics can eat them on Fridays. When languages merge, you get dialects and creoles. When cultures collide, you get history. And what is history but another branch of storytelling? No i’m not talking about the tv series – though that’s a fun thing too. In a lot of ways the thunderbird is not exactly a monster, it seen as many thing to a lot of people, to some a god, to others a nature spirit – and to most it’s the bird from the new Harry Potter film – but what is its story? A thunderbird is a giant bird, that shoots lighting and eat whales (especially orcas) it’s also a sky spirit of some Native Americans tribes from long before Europeans ever set foot in their land. Story of the great thunderbird could be hard from the tribes Northwest Coast through to the people of the plains, and each tribe has a different one to tell. 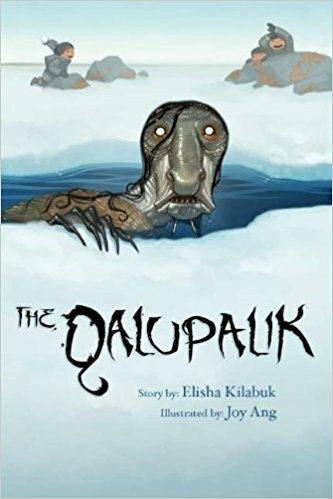 The Algonquian mythology tells a story of a thunderbird that controls the upper world and a great horned serpent that rules the underworld. The thunderbird throws around thunder and lightning at the underwater creatures. Menominee a northern wisconsin tribe tells of the thunderbirds that dwell in a floating mountain, they control weather like thunder, lightning, the hail and rain all the brutality of a storm. In their stories the thunderbird is also the messenger bird of the sun and they like to do great deeds like fighting the minions of the horned snakes known as the Misikinubik. In Ojibwe story they serve to hunt down evil people and the dark spirits of water, and live on the four winds. The Winnebago actually have a truly monstrous story of the thunderbird – one steals away a orphan boy and feast on the contents of his stomach and planned to do the same to the boy afterwards, but he was saved by his loyal pet pigeon hawk. These darker thunderbirds still fight with the water spirits, but they don’t distinguish between good and evil ones – in fact in Winnebago myth the thunderbirds started the feud. Because of this mixture of stories and origins it is seen a variety of ways, and while it need not be a monster it can easily become one. They have the head of a bird but some pictures depict them with ears where others have them having horns. They have bird like eyes but they shoot lightning from them. They can have a beak or teeth. The body is that of a bird but covered in many different bright colours. Wings that when they clapped together they make thunder. Claws big enough to pluck a killer whale from the sea and carry it away to feast on. They live in the mountains and other high up hard to reach places. Their feathers are often brightly coloured – especially when they’re actively creating storms. A dark thunderbird could be at the top of a mountain and your player have to fight it to save children it has abducted. A cool character might be a warlock, or even a cleric with the thunderbird as their patron – strong electrical powers but an utter hatred for the sea. Or maybe the evil water god has stolen all of the thunderbirds so he can take over the earth and you the heros must free them to bring back order. If like to know more about this here some link you might find useful. The first of the Japanese ones, it seem to be that if you’re looking for something starting with a odd letter u or x or o look outside Europe and you’re more likely to find something – transliteration of foreign alphabets can result in unusual spellings. A monster that been part of japanese myth since about the twelfth century, in tales of a ghost twisted cronefaced woman that died in childbirth. The haggard woman appears on stormy nights carrying her baby, crying for help asking passersby to hold the baby, once they take it she disappears and the baby becomes heavier and heavier then turning into a boulder crushing the person. A ghost born out of the story of a woman who had an untimely tragic death, there are many of them cross the world. The lady in white and La Llorona are a few more close-to-home ghosts of this type. The lady in white is a type of ghost found in rural areas across the world but most commonly in the UK and the New England part of America, it is said that she has had a tragic death just after and due to the death of her child (or sometimes betrayal by her husband) but roads, cars and horses can sometimes be involved too. She is seen on her own in the middle of nowhere, and causes anyone that communicates with her to die shortly afterwards – sometimes seen as a hitchhiker and whoever picks her up crashes and dies. La Llorona is a Mexican story of a woman who lost her children in the river and cries while is looking for them. 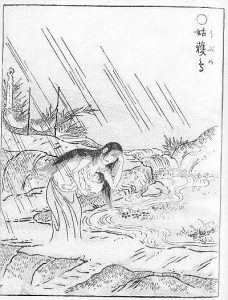 One version tells of her doing this after she has drowned them herself in a fit of rage, after finding her husband in the midst of an affair. It is said that she will try to steal children away to drown with herself now and again, or sometimes simply that she causes misfortune to those who see or hear her due to her extremely cursed natured. I find La Llorona a lot more scary than the white lady but comparison between these two and Ubume is interesting – they all show how a ghost is born from pain and how misery loves company. In media, whichever of these beings they use is usually just treated as a ghost story – but sometimes in TV shows like Grimm and Supernatural she is shown as some kind of monster that people need to be saved from because she is trying to kill them, which is tragic in that if someone had saved her from her pain then she would not be a ghost in the first place. A crone faced woman, with long wet black hair and crying eyes. A woman body wrapped in red silk, carrying a babe in her arms. Sometimes she is instead heavily pregnant. Or her body is covered in blood and she is carrying her underdeveloped fetus, since she miscarried and died in the process. She usually wears no shoes but sometimes she has no feet at all since she is a ghost and a lot of them don’t. She some shown to have bird like features, like a beak on her face and feathers on her and/or bird like feet, if so it said she has come to steal a baby away. These two very different image of her are because of some linguistic coincidences (baby-snatching bird and birthing mother being somewhat similar) and the conflation of the original japanese myth with a chinese bird-woman who could shed her feathers to appear human. She is found on stormy nights near where she had the baby which is often depicted as near a river or woodland. And she and other ghost like her are always found on there own just wanting a bit of help, just reminding you how much helping a stranger can hinder you sadly. The hero could be there and find the baby if it alive give a home, it dead lead it and the mother to rest. It shouldn’t be too hard as the ghost only appears near where she gave birth. The boulder/baby she gives could be a spell component for many a transmutation spell, a death curse or a necromantic ritual. Where an ubume baby is needed you would have to stop it becoming the boulder, while if you want the boulder you have to stop it killing you. Now this one really cheesy – a time traveler how chooses to go back to try help all these ghosts when they’re still alive so they don’t die tragically so they don’t become these ghost. If want to read more about any of these monster feel free to look at the links below. They’re everywhere today, usually as some teenage girl’s love interest, if we knew their history would we find them so attractive? Though the concept of blood-drinking corpses is an old one, the exact forms have varied over time – and the modern vampire concept owes its shape to a surge in encounters in Eastern Europe during the “Age of Enlightenment”. Whispers of vampires became louder in the late 17th century in the Balkans and most of Eastern Europe, with mass stakings of corpses to pin them into their coffins. From there the stories spread to the rest of Europe in tales of the ugly, pale creature that comes in the night to drink your blood – a vampiric human that lives forever, as long as they stay out of the sun, and looks like a corpse but never rots. Over the years many stories have been told, they’re one of the best known monsters in pop culture and they feature prominently in YA and urban fantasy. But it is the stories of Carmilla and Dracula that gave birth to the vampire we know today, the killer that we fall in love with because they are always beautiful, that hypnotise us and change into animals at will. Taking humans as their partners turning them and loving them forever or killing them slowly in a state of ecstasy. Those stories may well have drawn not just from the Eastern European vampire but from the Daemonologie written by King George, in which corpses could be inhabited by incubi and succubi, with properties similar to those of vampires but with more beauty and lust. But what caused these stories of vampire to start, what are they really? Well many aspects of the physiology of vampire can be explained by diseases. Porphyria is one of them, it is an inherited disease which comes in a few different forms – one of them is that the skin becomes sensitive to sunlight, if sufferers go out in the sun they blister and burn far worse than normal. This not only explains the idea that vampires don’t go out in the day it also provides their pale skin and the idea that they burn up in the sun. Tuberculosis (TB) may be another disease from which the theories of vampires spawn. It is an airborne bacterial infection, that mostly affects the lungs of it victims – it often makes them turn very pale, with swellings in their neck, tiredness and fatigue, loss of appetite, weight loss and can cause them to cough up blood because of the damage to their lungs. All these symptoms have been mentioned as a sign that someone has been fed on by vampire in a lot of the old stories. Catalepsy is a nervous condition that makes the body go rigid, it could be connected to the idea the vampire could stand so still. It also slows down someone’s heart and breathing rate meaning they may appear dead, and after some time they would be able to move again and the heart rate and breathing rate return to normal, so they may get back up after someone thought they were dead. People understood less about how the body broke down after it died back then, how the body decomposed and the form that decomposition took, like how the hair, nails and teeth sometimes appear to grow for a few days after the death, as the skin covering their roots peels back, and how the decomposition of the body takes some time to set in, especially in cold places like the Balkans. After death gases in the body build up, these gases can make the body make noise and muscles move which means they sit up, move arms, legs or roll over when they are dead, and these gases also inflate the abdomen which makes the body look like it has gorged on something, and if you were to stab that inflated abdomen then it would rupture and fluids would drain out. In a more mystical vein the reason they can’t be seen in mirrors is because it was once believed that mirrors allowed you to see people’s souls and vampires have no soul therefore they cannot be seen. The same applied for cameras when they were invented which is why they cannot be seen in a photograph or video in some stories. Fangs – sometimes just the top 2 canines, sometime all 4 of them and other have nothing but fangs – no teeth that aren’t sharp. They feed on blood, or sometimes on life essence such as the chinese ones, the Jiangshi, that feed on chi – and hop everywhere which is just funny, although potentially horrifying for ones that are half-rotten. Humanoid hands sometimes with sharp claws. They’re sometime veiny all over, but usually pale. Sometimes they’re stunningly beautiful, other times gaunt and unattractive – it’s rare for vampires to be of average appearance. A stake through the heart – but in some stories this only serves to nail them into their coffin, so if it is ever removed the vampire may wake again. Sometimes this is the preferred method as the vampire is possessed by a dark spirit – and destroying the body completely would allow it to possess another, while trapping the body traps the spirit. Some vampires can make ghouls which are partly turned people, they eat bugs and the leftovers the vampire make like body parts and bones, sometimes these ghouls can be controlled by the vampire that created them. Some vampires can make thralls which are hypnotised humans, whose wills are slaved to the vampire. They usually drink from these thralls, and some may use them as a source of power within mortal governments and the like. You could write a story or game from the thralls’ or ghouls’ point of view, how they see the vampires. What if the reason vampires never look the mirror is not because they can’t be seen but because they can truly see the nightmares in it instead – forcing them to regard their own monstrousness. Since they can turn into an animal can they become stuck in that form, how do they feed in that form, is that where the first vampire bats came from? If they lose their soul when they’re turned, what happen to their soul? Does it die or disappear, or does it become a ghost linked to the vampire forever seeing all the hell that they bring about? Could you give a vampires a soul – and would they get their own back or a new one? This could be done as a curse of remorse, or maybe a vampire would quest for their return to humanity, or perhaps their lover could give them it – if so, did they go on a great quest to find a new soul or is it a heart shaking story where they give the vampire part of their own soul, so they are forever connected, in some ways the two are one. Perhaps a marriage ceremony might have this effect – possibly even surprising a vampire who was getting married to help hide their nature. p.s. There’s three days left on our Jigsaw Fantasy Kickstarter – take a look before it’s too late. 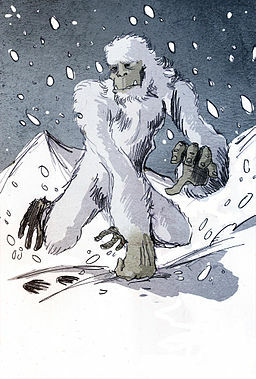 The first time I came across the Wendigo was in “Charmed” which had an interesting take on the concept – combining it rather strongly with werewolves. I have since learnt more about them. 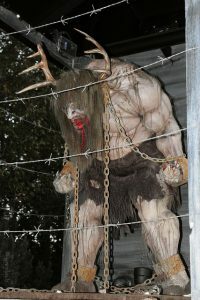 Wendigo are a human eating monster of the Native Americans of the Algonguian tribes, dating from long before europeans ever set foot in their land. The story tells of how people can be transformed by eating human flesh into a monster that lives only to eat more humans and yet is never full. Some say it is the unthinkable deed of cannibalism that transforms them, while other stories say it is a demon or evil spirit that does so, able to possess those who have engaged in the act. Many of the stories also tell about how they hurts and kills people out on their own in the northern forest but some talk about how it can be hunted and killed – the only way is with fire. Because of its connection with evil spirits its image is sometimes changed in media to something more demonic, with horns and a ghastly grin. They tend to look humanoid in both shape and facial features but are sometime depicted with the head of a deer or just the antlers of a deer. Red or yellow eyes – in more demonic interpretations they may glow. They have sharp yellow teeth. Very long arms – as long as their whole body. Human like hands with long bony fingers and claw-like nails. They generally have gaunt bodies which can be covered in grey, decaying skin or thick matted hair – with a long bony chest, akin to that seen in an emaciated corpse. Big long legs with have been depicted as human or the hind legs of a deer. Feet are normally human with long sharp claws, but they may be hooved – particularly in media where they’re associated with christian demons. The have superhuman strength, move faster than any human can and are effectively immortal. Could the demon or evil spirit be removed from the body somehow like when the body is hurt? And if so could it be moved into someone else and harnessed to grant a host immortality or superhuman strength? Does the human meat need to be fresh? A good person who becomes a Wendigo but only eats the long dead and use the superhuman strength, speed and endurance to fight crime. Some have taken over the town and you need to clear it out before it can be lived in again. The Wendigo spirit could be the god of the forest or the underworld and it must be fed to keep it happy. This is a new one to me, chosen because… well there aren’t many monsters beginning with “x” other than Xenomorphs from the alien moves. 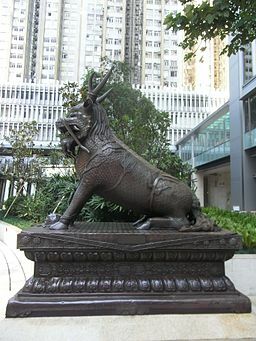 The Xiezhi is a goat like creature from Han Dynasty (206 BCE) of China, it was said it could find wrongdoers and see evil and injustice better than any man. Over the centuries many stories have been told all over china about how it used its horn to point out who had started a fight or argument. It horn would glow and it would point at whoever was at fault in the argument and, if the fault was sufficiently severe it would charge, ramming at them with its horn, gouging holes in them. If the wrongdoer tried to escape the Xiezhi would kill and eat them. The stories tell of how the emperor would use one as judge of crimes and criminals, and that he trusted its word so much that he declared it the only thing which could judge the emperor himself. Because of this unique power over the emperor, it was the ultimate symbol for law and justice – and it remains so even to this day, it can be seen in buildings of law and order like the law schools, police stations, courthouses, and some police uniforms even feature them. Over the centuries as this creature fell into myths its shape has shifted and changed, to a point where the statues of it look vastly different from one location to another. Some show a simple goat with one horn other have features of dragons or lions as well as some form of horn. It has a long horn on it head which can find evil and wrong doer. The head is sometime that of a goat, but more often that of a lion or dragon. It stands on all fours and has a stocky body which can be depicted in scales, fur, or a mixture of the two. It can have hooves or clawed feet. Lastly it has short stubby tail like a goat’s. Why does it change its form? Perhaps its a sign of age, or perhaps it has one form for battle and another for peace. Is the horn useful magically? If so, how do you get the horn? Can the Xiezhi be killed and the horn cut out, or does it have to be freely given – or does it lose its horn/antlers and grow (a) new one(s), like a deer, so you just have to wait for it to fall out – although the dead antlers may be less potent in their effects. What allows it to see who is a wrongdoer? Is it the horn or eyes or brain or is it some other part of the body? Do the scales or hide have any powers? Could it be used to hunt people down over long distances? Can it be wrong? And if so what are the causes (and consequences) of this? What other powers do they have? Can they hurt demons since they can sense evil? If you’re in a fantasy setting it could be some kind of god or a steed of one. Since its form shifts maybe it is a shapeshifter – in D&D it could be a form taken by Gold Dragons. A wild west story where a Xiezhi help a Sheriff find criminals. For the duration of March, Mondays will play host to monstrous beasts and beings. While we intend to eventually complete a full alphabet for these too, Mam Bach was getting burnout from 6 months of Mythic Mondays, so we’ll be doing it one month at a time. Zombies are in some ways a very new monster, since the version in a lot of people’s’ minds has only been around since the 1960s – but their origins are older than that, with the first written description being from 1816 Brazil. The term “zombie” has its roots in Voodoo1)Or Vodou, Vodoun or whichever spelling is chosen – it was not originally a written religion, and thus spellings are varied., which is practised mostly in Haiti though it derives from a mixture of African religions crossing with Christianity. In Voodoo a zombie is a dead person who has been revived by a bokor, a Voodoo sorcerer – that person is then under control of the bokor. Many stories suggest that darker bokor use a somewhat alchemical ritual to make living people into zombies. It usually involves a specially prepared mix of earth, roots and tetrodotoxin (which comes from a pufferfish or related species). If done correctly it can leave someone alive but not in control of their own body. There is also an astral zombie, a person’s soul that has captured by a bokor to use for magical purposes, this suggests that making someone into a zombie may split their body and soul which may be why the zombie has no free will. Priestly bokor are rarely said to deal in the physical zombies, but may interact with the astral form, using their aid to heal the wounded and infirm. So far these zombie are far away from the zombie we know and love today. Indeed, modern zombies are more akin to other forms of undead than to the Voodoo zombie. Many forms of media have been involved in the journey to the zombies we know today. The earliest zombie apocalypse story might well be “The Day of The Triffids” – a book where sentient plants, which move around in herds, slowly hunt down humans to eat – making a rattling noise to communicate with each other when they find fortified prey. The similarities to modern zombies notably include the requirement that they be decapitated in order to kill them. The next notable development is in another book “I Am Legend”, they still seem to move around in herds but were only active by night because they were essentially a form of apocalyptic vampires but the main character treats them like they were zombies, thinking them mindless beasts. Cementing the zombie into popular culture was “Night of The Living Dead”2)Aided by the fact it became public domain upon release where the creatures have almost all of the archetypical qualities or the modern zombie, though they are called ghouls by a character within the films, with the term zombie coming from the fans and the John Russo series of sequel films – which also introduced the famous hunger for brains. These are not all the examples but they are major parts of how the myth became what it is today. One way you could use the ideas from the Voodoo zombie in your games and stories is the person could be saveable, if their soul (the astral zombie) could be recombined with the physical zombie – which means killing them may become a dilemma for your protagonists, especially if the victim is known to them. There could also be a cure for the zombie-creating alchemy, needing rare ingredients that the players must quest for. Or there could be a great sorcerer who knows how to reverse the ritual and bring the friend back from the dead but of course you have to go and find this sorcerer first or you may have to do something immoral for the sorcerer to get your friends back. Drawing instead from “I Am Legend” you could instead choose to have a zombie infection that behaves differently in the living and the dead – with those already dead upon infection being animated as mindless ghouls, but those who were alive remaining somewhat aware and possibly even being able to recover their faculties while remaining zombified. Zombies are usually only humans, though some games and films, such as resident evil have zombie beasts – most often dogs. Still these are rare enough that I’ll be mostly ignoring them for this section. Zombie are often dead even though they can walk and make noise, but there are many examples where this is not the case, often with a more “scientific” approach to zombies. One modern example where a living human has been mystically zombified by tetrodotoxin is done well in the TV series Grimm: though the zombified individuals lose willpower they are not innately dangerous – unless something goes wrong. They’re usually mindless beasts, all they know is the need to feed – often specifically on living humans, like in Walking Dead, but there are examples of such zombies being capable of thought or even smart in stories such as iZombie and zNation. Occasionally instead of hunger they have an irrational need to kill – such as in 28 Days Later – with the eating of their victims being an afterthought or even an irrelevance. They tend not to be able to see well in the dark and are attracted by light, sounds and some can smell fresh of blood so sometime hiding is better than fighting, you may even be walk among them by covering yourself in rotting fresh and old blood, like they do in The Walking Dead. They are usually hard to kill, and tougher than the average human in a fight – usually a head shot will kill them but as always there are examples that go again this rule, such as Braindead with has the zombies animated by magic and has any part which is dead come to life, with only way to end it being to understand and break the curse. Their skin can be anywhere from slightly grubby to green, thin and rotting with skin missing and bone visible – sometimes both extremes can even coexist, based on the age of the zombified corpse. If the zombie are reanimated from old buried bodied they can often be boney with hard, yellow nails which can be claw like. They are not usually ambush killer, they tend to make groaning noises which let their prey know that they are coming but also let other zombies know where food can be found, giving them a strong pack mentality, all of these things are clearly seen in Shaun of the Dead, Zombieland and George Romero’s films. Being a zombie is often seen as contagious disease that is spread by being bitten or scratched by them or a mixing of the blood like in 28 Days Later – but this is not always the case, it’s common that everyone who dies is reanimated, and being bitten or scratched simply accelerates the process. Firstly it’s important to consider how you can mix any of the possibilities together – it may seem hard to work out how you can be a living zombie with rotting skin but a fungus or a rare bacteria that released tetrodotoxin and ate away your skin would make you mindless and allow the skin to rot even before death. Then think what setting your story is in. In science fiction you’d likely want some sort of virus or nanite infection – but you’d also have alien zombies which could still have many of the abilities of the alien, for instance they could have telepathy and have a full on hivemind like the borg. Or perhaps you have a species without a mouth, that eats in some other way, like through their skin, and they just need to touch you to infect you. In a superheroes setting your zombies might keep mutant powers like super strength, this means they could rips legs and arms away. Or what if your zombies virus can mutate – how does the virus change the physiology of the people that are infected. 1. ↑ Or Vodou, Vodoun or whichever spelling is chosen – it was not originally a written religion, and thus spellings are varied.